Detroit pizza is unusual in two ways when it comes to cheese. The first is the use of Brick cheese, a high-fat aged cheese from Wisconsin with a uniquely tangy, salty, buttery flavor that's hard to replace with alternatives. The second is the edges. If you've ever been to Pequod's or Burt's Place in Chicago, or, better yet, had a pizza from Windy City Pie in Seattle (incidentally, the best Chicago-style pan pizza I've ever had anywhere, including in Chicago), then you're familiar with the concept of a crispy, blackened cheese crust—the shelf of crisp, lacy cheese that surrounds the edge of the pizza. This is where the real magic of Detroit-style pizza lies, and, as I found out, getting it is not exactly straightforward. My BIL grew up just outside of Detroit. He recognized the pizza in Kenji's article. He pointed out Little Caesar's pizza seems to emulate this style. It makes sense once he said it. I had often wondered what was the deal with Little Caesar. Many miles apart, our family is making this pizza this evening. Thanks for the inspiration! Inspired by the pistachio pizza at Spacca Napoli, I've been playing around with some variations on this theme. I use a (thin) base of whipped cream, pistachios processed with olive oil and salt in the Cuisinart, sausage and basil. I love the loose texture of the sausage on the Spacca Napoli version and I've found I can get a similar texture by cooking sausage with a little white wine. I make a 'semi-homemade' version of the sausage from the Mozza cookbook by getting freshly ground pork from a butcher and adding seasonings (garlic, pepper, red wine vinegar, paprika, etc). For last night's version, I added some sauteed scallions, leftover pork belly cubes (we were almost out of sausage). I have not been to Spacco Napoli in ages. I was wondering if the lightly whipped cream was something they actually did or was it your approach to replicate what they might have done? It is great to see you are still progressing on the pizza front. The whipped cream is our addition (which I learned from Nancy Silverton's Mozza cookbook). We've made it with and without the cream and I think I prefer 'with'. As far as I can tell they don't use cream at Spacca Napoli. thaiobsessed wrote: Inspired by the pistachio pizza at Spacca Napoli, I've been playing around with some variations on this theme. I use a (thin) base of whipped cream, pistachios processed with olive oil and salt in the Cuisinart, sausage and basil. I love the loose texture of the sausage on the Spacca Napoli version and I've found I can get a similar texture by cooking sausage with a little white wine. I make a 'semi-homemade' version of the sausage from the Mozza cookbook by getting freshly ground pork from a butcher and adding seasonings (garlic, pepper, red wine vinegar, paprika, etc). Would you mind sharing your dough recipe? So, I actually have several 'recipes'/techniques that I use. Mix 672 g flour** with 437 g ice water. Mix in a mixer with dough hook or by hand until well incorporated. Let sit for 20 minutes. Add 135 g activated sourdough starter. Mix 2 minutes with mixer (or by hand). Add 13 grams of salt. Mix 2 minutes, then knead for about 3 minutes by hand. Refrigerate dough for 24 hours. Remove dough from fridge, knead briefly and divide dough into 4 pieces. Shape dough into balls. Place each ball into a lightly oiled tupperware container and refrigerate for another 24 hours. **I generally use a high gluten commercial bread flour when I'm baking the pies in a regular oven, on a stone--you can use King Arthur bread flour as well. I will also sub in about 10% whole wheat flour and/or use a little rye flour. It's hard to give an exact recipe because there are so many factors involved (flour, temperature, hydration, starter, kneading vs. folding, dough handling, etc) but hopefully that's helpful. Whether this belongs in "homemade pizza gallery" or "today's discovery," I don't know, but I had a breakthrough in my home pizza-making progress when I discovered Flat Out pizza flatbreads at the store (each about 4" x 12", package of 6 for $3.99). Yes, "it's so easy, why don't I make it myself? ", but I am pizza dough-challenged (among my other dough-related challenges), which significantly inhibits my progress. One week someday I'll take a lot of time just to practice my pizza dough skills. Right now I just want to practice toppings. So, these Flat Out pizza flatbreads are certainly easy to use. I read several recipes and watched some YouTube videos about them first. I noticed a wide range of cooking times: the package says prebake the crust for 2 minutes (why, I'm not sure, since it's already fully cooked), and then for another 4 minutes after adding toppings); at the other end of the spectrum, I saw recipes with no prebaking and cooking times from 9 to 12 minutes. I used a perforated pizza pan and though I'd have gotten crisper results placing it directly on the oven rack, even though most YouTubers I watched cooked them on baking sheets. Not much flavor to the plain white one, but I saw comments suggesting to steer clear of the "spicy" one, which has a lot of seasonings on top that are better scraped off. I'll keep practicing. Just wondered if anyone else had any experience with these Flat Outs. here's a gallery (https://imgur.com/a/cG0NqRK) of some examples spanning the last six months. 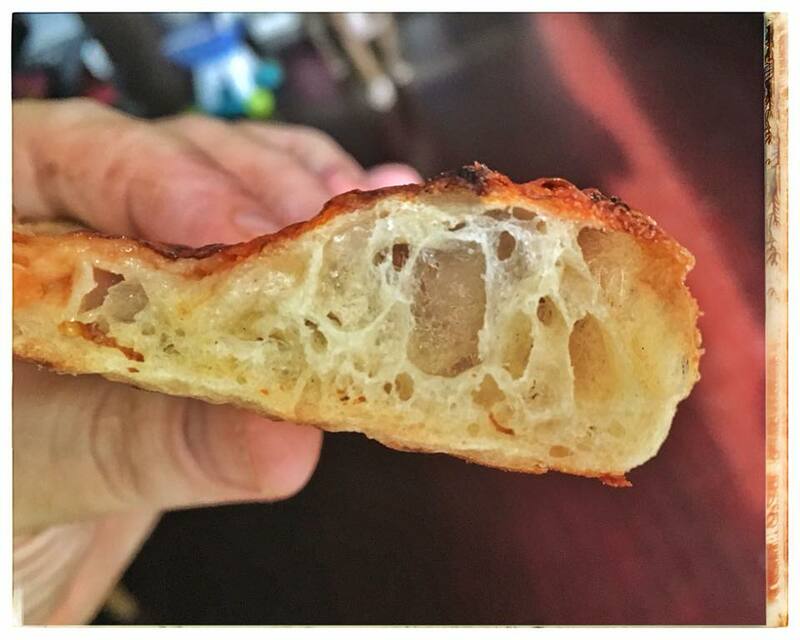 crust is sourdough cooked in a crappy home pizza oven (blackstone) that is getting replaced by a roccbox soon. Wow, those are gorgeous pies! Would you be willing to share how you make your hot honey? One of my favorite things to do with leftover pizza toppings: Waffles!! Congratulations on finding an elusive morel. They tend to come up at the same place, so check it out next year. Waffle irons are so versatile. Something I never appreciated until I saw a firehouse cook at work. Crisping leftover Thanksgiving stuffing is another great use of the waffle iron, then top with cranberry sauce and turkey. Your use of pizza topping leftovers is yet another inspiring idea. thaiobsessed wrote: One of my favorite things to do with leftover pizza toppings: Waffles!! Holy pizza disruption, Batman! That looks awesome! Very cool, TO. Another little twist on this theme: dosa batter in the waffle iron with the leftover toppings. Dare I say that waffle sounds better than the pizza! But to be sure, I'll need to try both. What time is dinner? 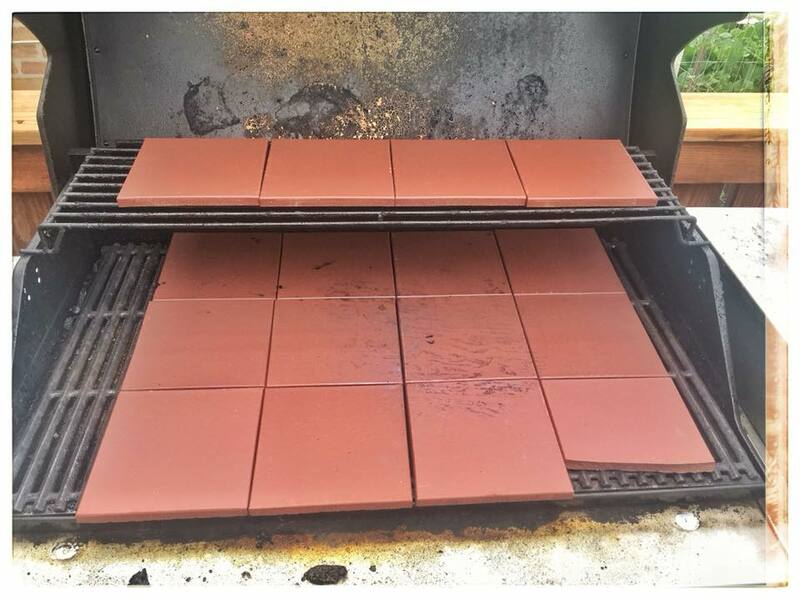 Last week I finally got around to buying some cheap unglazed quarry tile at Menard's and trying the pizza stone hack on my gas grill outside. All in all, it actually worked really well. Got some great oven spring and nice charring on the bottom of the pizza. The bottom finished in about 3-4 minutes. Problem with this method, though, is that since this isn't a true pizza oven, you don't really have that heat from above. So after the bottom was done, I pulled the pizza and finished it under the broiler in the oven. Dough was just a no-knead dough at 75% hydration. How long are you preheating the tiles before starting your bake? What temperature are you able to achieve? I preheated them for about 45 minutes I want to say? I have no idea what their surface temperature was. The thermometer on the grill itself was maxed out to past 650F, but I don't necessarily trust that thing. Given that the bottom finished in 3-4 minutes, I'm guessing that the tiles probably did get to around 600-650F, though. Oh, and the quarry tile was $16 for a pack of 28 6"x6" tiles. It sounds like you have hot enough temperatures to get what you want. I'm surprised about the need for the broiler. I see you have some tiles up above, too, which should convey heat to brown the top, too. When I was making Kenji's Detroit pizza over the winter, I put the pizza on the bottom shelf position on a steel plate and at least once on the floor of the oven, too. Either situation, the pizza browned on top. Of course, this was a pizza taking 12 minutes to cook. 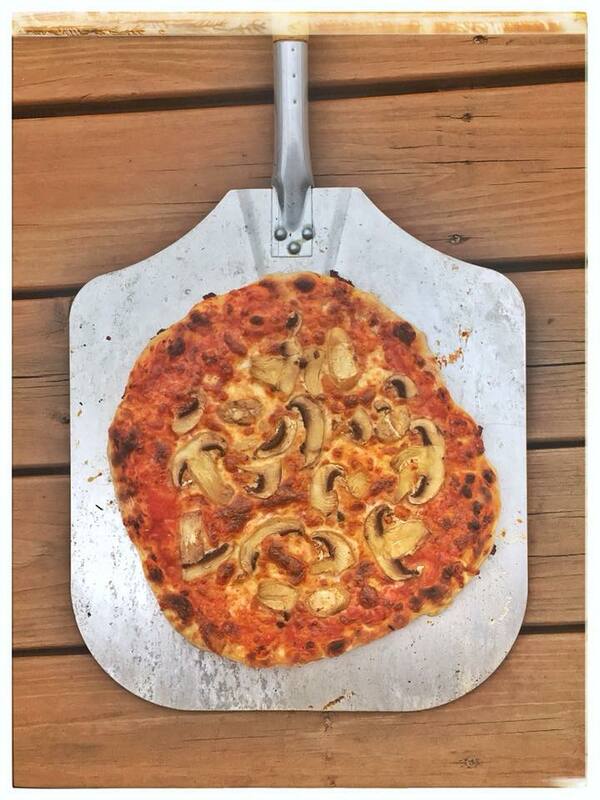 I'm going to follow along to see what advise others offer, because I would like to cook a pizza outside. Yeah, the tiles above didn't really do much. Also, note that the top rack of tile is about one third the width of the rack below (just one row of four instead of three rows of four.) It didn't even seem to have much of an effect on the part of the pizza that was directly below the tile. I made two pizzas and the first one was on the verge of being burnt in large parts while the top still looked very blonde. There was no color or blistering on the top parts of the edge crust. That was added with the broiler. I did my best to get the pizza in as quickly as possible to avoid heat escaping, but it didn't seem to make a difference. One thing to try is to simply cook at a lower temperature, maybe more like the 450F or so, and then both parts should probably cook evenly. But, of course, that will be a slightly different style of pizza. I suspect that would work well for a Chicago tavern style. Heh. Perhaps unsurprisingly, I'm not the first one to have that idea. I saw some other ideas where the area directly above the pizza is merely domed with aluminum (either foil or baking pans) to trap the heat into a smaller space. Obviously, that won't have the heat retention and mass of something like quarry tile, but I'll give it a shot next time out. 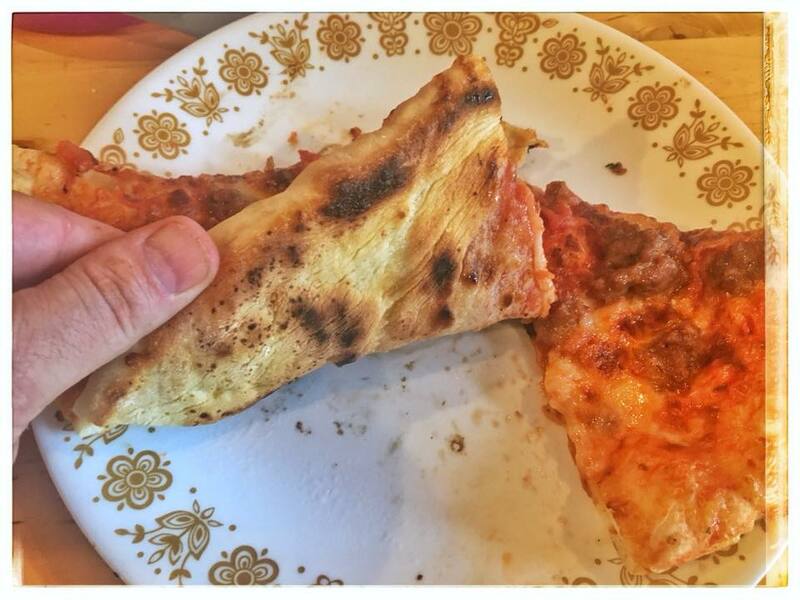 When the bottom of the pizza is cooked, but the top needs more time, you might want to give the Searzall a try to apply heat directly to areas that need it. Here is a cheesy little video I did showing its use on a pizza baked on a steel in the oven, but it applies to any pizza where the top needs help. Ha ha! Love the video, Bill. I was just thinking maybe a blowtorch would help. I looked up the Searzall and now I get why it's better than a plain blowtorch. 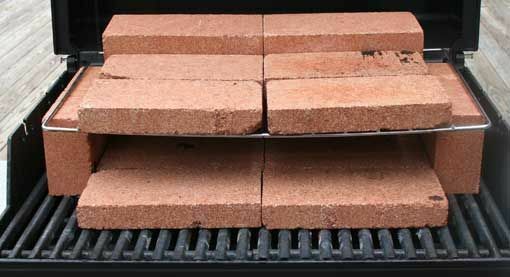 Binko, I wonder if a few fewer tiles on the grill would be better for air flow. Ooo...that Searzall looks pretty neat and that pizza seared up looks great! Interesting idea about perhaps removing tiles. I'll give it a shot. If anyone is interested in the thermodynamics of baking pizza (and isn't afraid of some equations), have a look at this terrific article published on arXiv.org recently: The Physics of baking good Pizza. I haven't looked at it for years, but I was greatly impressed with the chapter on thermodynamics in the first volume of Modernist Cuisine (table of contents here). As I recall, it's somewhat more accessible than the above article (but, of course, not focused on pizza). There seems to be a fair amount about pizza in Modernist Bread (table of contents can be accessed from that page), but I have yet to look at that work. Nathan Myhrvold and his army are now working on Modernist Pizza. That should be essential reading for anyone truly interested in pizza science. Rene G wrote: There seems to be a fair amount about pizza in Modernist Bread (table of contents can be accessed from that page), but I have yet to look at that work. Nathan Myhrvold and his army are now working on Modernist Pizza. That should be essential reading for anyone truly interested in pizza science. I really like Modernist Bread, but the pizza section is weak. I'm looking forward to Modernist Pizza.